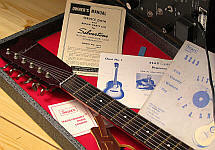 Abbreviations: M-int, NM - Near Mint, E- Excellent, VG- Very Good, G- Good , F-air, P-Poor, NS- Non-Stock, HBEG- Hollow Body Electric, FHAC- F-Hole Acoustic, FTAC- Flat-Top Acoustic, SBEG- Solid Body Electric, SSEG- Semi-Sold Electric, MIJ- Made In Japan, MOD - Modified significantly from stock, w/ O/C Original / Case, BIN- Auction ended at 'Buy It Now' price, BO- Auction ended at 'Best Offer' price, UNK - Unknown manufacturer or model number, ACC - accessory. ALL RATINGS SUBJECTIVE. Links in blue will open in a new window. Looks like we're ending March on a pretty solid note, with plenty of good stuff to ruminate over today... I'll get prices totalled up and have a full March Money Report tomorrow. No foolin'! 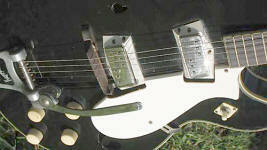 I'm gonna throw our TWO lead-off guitars over into April just so folks won't miss 'em; they're incredible finds. Two different auctions for 13XX custom color models in 'flame red and black' and 'yellow and black' finish, super rare and near the last of the narrower 'C' body shape. 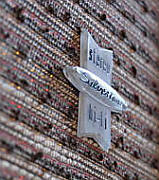 As usual, the nets are full of Silvertone fishies just a floppin' around this Monday. 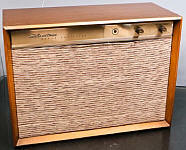 We've got an unusual novelty (see note below), a re-listed 615, a couple of nice Dano 'U' body-shape models, and a high-dollar 1446 come and gone on the block this weekend. 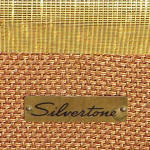 Homer Simpson loves his donuts as much as I love Silvertones. In fact we often have that same drooling reaction to a particularly tasty one (Homer the donuts, me the Silvertones). Teacher : Now, um, I’m going to burn this donut to show how many calories it has. Teacher : The bright blue flame indicates that this donut was particularly sweet. Homer : This is not happening... this... is... not... happening! That's pretty much how I reacted when I saw that lovely 680 that had been made into a clock. 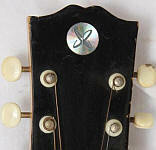 680 Kay FHAC MOD $205 Clean, no bridge, some kind of refinish/logo re-pour to headstock, stamped N-4, partial serial 8950. 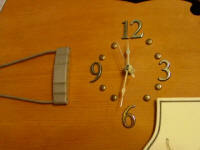 Oh, yeah... it's a clock. 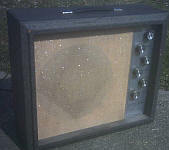 1448 Dano SSEG guitar and tube amp in case with no amp G $200 Guitar is clean, light edge wear, case is missing amp/grille... Peek a Boo! 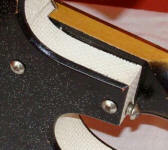 1419 Dano SSEG w/ C G $280 Edge wear, 1" neck ding, possibly re-finish, logo broken on "S"
Harmonizing Friday! Nice to see a 'Black Beauty' today, and a rare 1317 in wonderful shape as well. 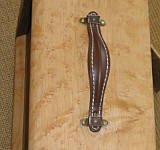 Check out that grain on the back! Nice to see a couple still together after almost 50 years! That's the case with this 1304/1451 pair that went for nearly $500 today. How about that 'best I've seen' 1454 going for nearly a grand? I wonder how Chris Isaak feels about the 1446 acquiring his name as its nickname? Maybe he'll have me on his new show. Anyway, he'd probably want some royalties, considering the money these babies are bringing these days. Got some 'Autoharp and 1448 Mania' going on today as well! 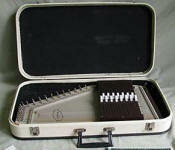 2574 Oscar Schmidt Autoharp w/ OC VG $75 Clean, accessories, books, record incl. 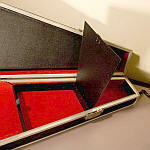 2573 Oscar Schmidt Autoharp w/ OC VG $75 12-chord, clean, books and strap (!) incl. 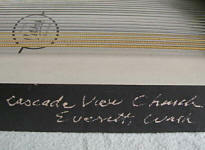 1838 Oscar Schmidt Autoharp w/ OC VG $118 Clean, all accessories (picks, tuning wrench, book... they had stopped furnishing the Mother Maybelle how-to record by now), ID scratched into side "Cascade View Church / Everett Washington." 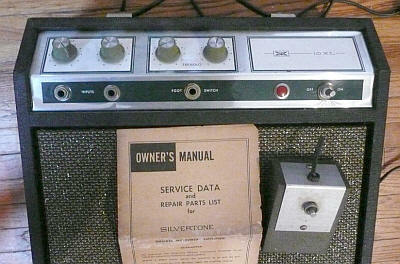 1436 Teisco MIJ SBEG VG $260 Whammy missing, clean, (1) knob missing, (1) selector switch missing. 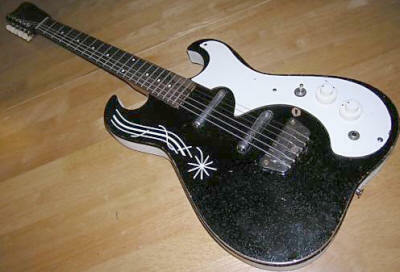 I thought my eyes were fooling me, but it is sporting a stock green/red/black burst paint job! How cool is that? My Sears & Roebuck catalog collection is kinda hit-and-miss from the 1930s. 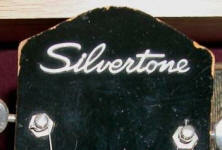 The transition from "Supertone" to "Silvertone" occurred in the late '30s, and this guitar is from those first couple of years. 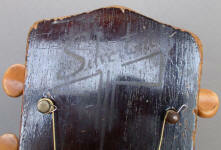 The stamping on this 'Artist' indicates a build date of 1939, and even then Harmony was following the stamping conventions that make their guitars so easy to ID and date. 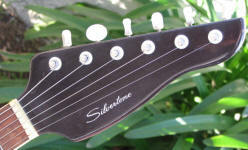 Check out the fancy headstock work and that incredible wood binding! 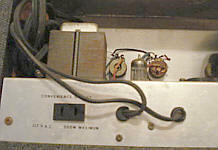 2255 Harmony FHAC w/ C VG $458 Clean, some surface wear to front treble lower bout, NS electric pickup added, stamped S-39, serial #2581H2255. 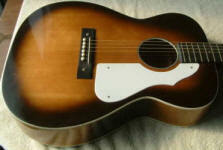 1413 Kay SBEG w/ C VG $390 BIN Minimal wear, screen print on pickups and tailpiece cover show light rub-off on the treble side, pickguard and knobs very clean. Aside from the multiple stickers, it's in pretty good shape... if that's a vintage Flip Wilson sticker, though... that's pretty cool! Pretty good weekend haul; some nice 'Chris Isaak' models in the mix, a seldom seen 708, an early 1448, a rare 1303, a nice 619... check 'em out! 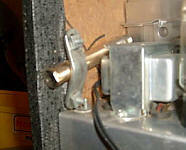 Spring has sprung, and so have the crazy amps! 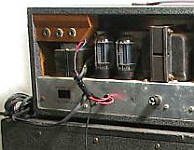 This first item is the third wacky amp we've seen this month. 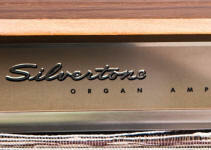 After TWO of the UNK 'Hi-Fi' amps have come and gone for sale, along comes this 4707 organ amp. 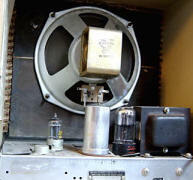 We see the guts of these amps from time to time, but rarely do we see the entire groovy setup. I believe there may have been legs on this item originally; still looking for a catalog listing. I'd love one to plug my MP3 player into. 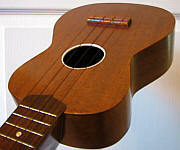 831 Ukulele VG $74 Skier design, clean, light edge wear, deco logo, 'signed' Arthur Godfrey photo and vintage "You Can Play" book incl. 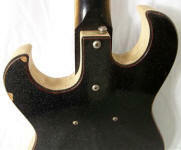 643 (maybe a 621)Harmony FTAC w/ C G $75 Clean, edge wear, scrape on bass upper bout edge , don't know if it's an ink run or what, but it sure looks like this one was stamped E-67! 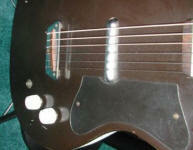 1448 Dano SSEG guitar and tube amp in case G $400 Amp shows wear inside and out, guitar has edge wear, discolored knob inserts, low E tuner shaft missing, extra set of Grover tuners incl. Aside from the easily removable mod, this 1484 setup is pretty sweet. Add a less than 400 dollar price and it's REALLY sweet! Everything works, covering looks great... really the best deal I've seen on a 1484 lately. But... I wonder if their 'hotness' is diminishing? 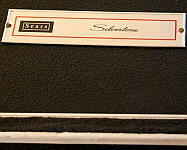 I've seen more than a few 1484s languishing on ebay, without even a bid. Maybe the starting bid was too high, maybe it was just timing... who knows? Happy St. Patrick's Day to ya, me lads and lasses! 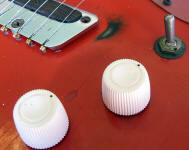 Grab yer Silvertones and pick out a little "Whiskey In The Jar" or "Risin O' The Moon." 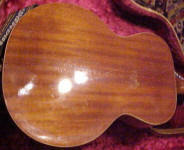 That late-era ukulele is in pretty sweet shape, and I gotta show you this very, very early 'Kentucky Blue.' It's so early, it's faded to an appropriate-for-the-holiday green! I reckon the paint engineers at Kay hadn't quite gotten the "Kentucky Blue" formulation down pat just yet. A pretty good pre-Patrick Monday, I'd say. A seldom-seen, lightly modded 1350, a very nice 1423 (they seem to be pretty hot right now), great-looking 1333, super clean 643, and we haven't seen a Sovereign-based 633 in a while (most folks that have 'em don't seem to not want to sell 'em). 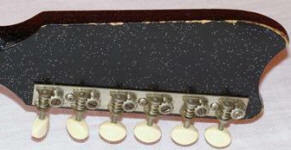 Looks like the rest of the 'kit' (pickup bezels, knobs, tuners, etc.) 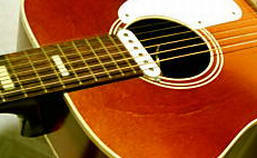 is set to auction off over the next 24 hours. 1452 Dano SBEG with tube amp in case VG $500 Clean, light edge wear, buckle rash to whammy spring cap, whammy bar present, triangle neck plate, thick script logo, footswitch incl. 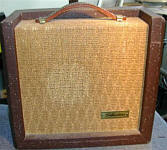 1484 Dano tube amp w/ cabinet VG $710 Very clean, rev/trem work, spkr. 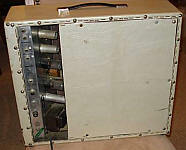 cab has light wear, original manual/schematic incl. Norm Abrams, eat your heart out! 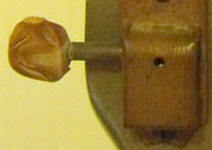 Here's some fine woodworking going on for this re-cabineted1333. The old box was warped and in poor shape, so the seller took exact measurements and duplicated our formerly alligator and tweed friend (right down to that crazy top curve!) choosing woods that echo the faux covering of the original. What a beauty! Check it out! 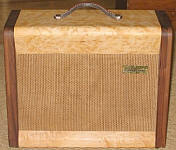 1333 Dano Tube amp MOD $450 Recently serviced, trem functional, original grille and logoplate, new handle, control panel has some scratches and oxidation, 3-prong AC cord added, new cabinet handcrafted by seller in Black Walnut and Birdseye Maple, with a hand rubbed oil finish. 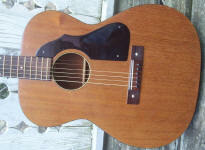 1457 Dano SSEG with tube amp in case G $425 Clean guitar, some edge wear, amp has major adhesive seep on knobs , some edge wear, scratchy pots on amp, strap and mic incl. 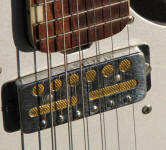 Don't you wonder why some guitars are big hits and others aren't? That's the case of the 1439. 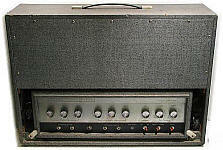 Offered during the same time (1966-68) as the 'Chris Isaak' 1446, and the popular 1454, the 1439 just didn't seem to catch on. 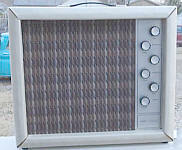 Nicely appointed, with a fair price ($84.95 in 1967), it's a wonder we don't see a lot more of these. 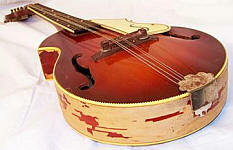 I'm glad this one brought some good money; too often the rarity of an instrument works against a high auction price. 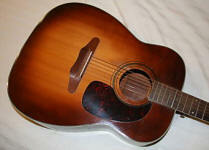 Don't forget to visit the new page for the still very popular (7 sold on ebay last month) Harmony-made 615 acoustic guitar! 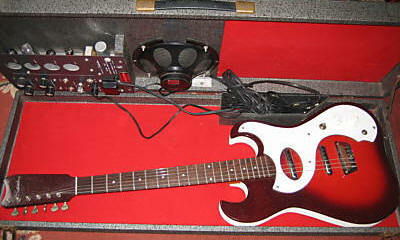 1457 Dano SSEG with tube amp in case NM $990 Near mint just about sums it up; super clean guitar and amp AND all the original paperwork, cords, strap and footswtich. This is the most complete 1457 I've seen, except... curiously, the 'cord keeper' is absent as is the screw that held it on (see last pic). 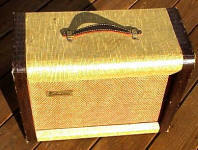 Not a bad haul for a Tuesday; Nice 674, great looking 1405, very nice 1443 bass, and an unusual 'UNKnown' amp. 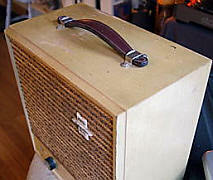 1459 Dano tube amp G $50 Covering clean, pegboard replacement back panel, a few grille snags, and "every once in a while makes this annoying wailing sound"
2574 Oscar Schmidt Autoharp w/ OC VG $150 BIN Clean, tuning wrench incl. 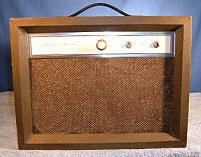 UNK UNK Tube amp VG $251 This amp comes around every now and then. 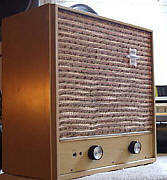 I believe it was actually marketed as a 'hi-fi' speaker extension, but it has a 1/4" input and has popularly been pressed into guitar duty. 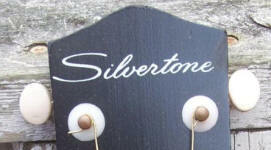 No, you're not goin' crazy... that really is a Silvertone 'Dobro®' style resonator guitar. Made by our friends in Italy, this bolt-neck EKO is an interesting addition to the quirky family of Italian-made Silvertones. Happy Monday! 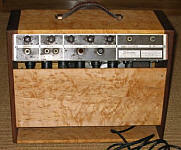 Here's another amp from our friends at Indigo Ranch Studios Sale of the Century. 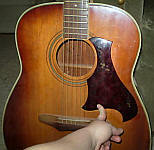 Just think, kids.... Neil Young or Bo Diddley or Albert Lee or Bob Dylan or any number of musical legends coulda strummed a big "E" chord on this baby; they've all recorded at the famous Indigo Ranch. 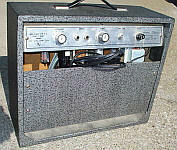 1484 Dano tube amp w/ cabinet VG $680 Clean, rev/trem work, slight dent to front panel, footswitch incl. 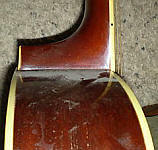 1413 Kay SBEG w/ C G $193 Clean, some edge wear, pickups and tailpiece cover still show 'arrow' silkscreen design, truss rod cover has screw crack, pickguard has some NS screws and a chip/screw crack close to neck, extra strap button hole, dunno what's up with the logo... double screen? 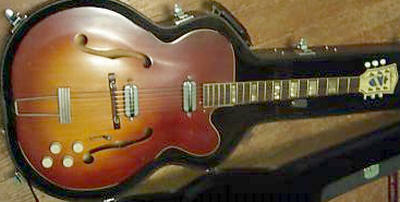 1423 Harmony SSEG body only $78 Clean, no hardware, electronics, strap button... nothin'! Fridays are funny; generally a little slower, auctionwise, than the rest of the week, I imagine because such a flood of items will end their auctions over the weekend. 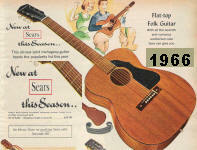 Do remember to visit the brand new page for the 604; one of the most popular guitars Sears ever sold. 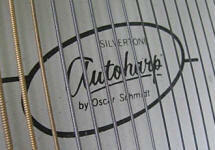 2574 Oscar Schmidt Autoharp w/ OC VG $28 BIN Clean, one chord bar support broken, chord pads are letting go of bars, tuner wrench, tuning guide, picks incl. 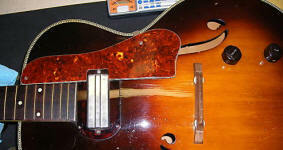 1371 Kay HBEG VG $950 BO Clean, some surface dings and edge wear, electronics re-wired, period but not original pickguard. It's entirely possible this is a 1425 . Well, looky here! 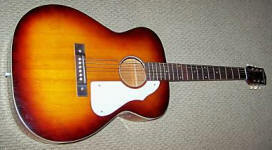 When I saw this lovely brown guitar going up for sale, I at least knew it was a Harmony-built Silvertone. 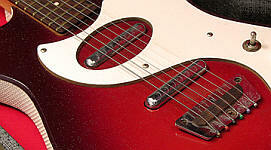 My brain also recalled seeing a big, splashy color catalog ad for just such a guitar. So, off to the catalogs I go, until I finally found it in the 1966 Sears "Wish Book." I've never seen it anywhere else. 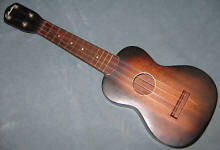 Reckon Harmony just got a good deal on some mahogany stock and cranked out a few thousand of these? 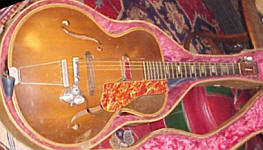 Similar to the Harmony-branded H165, the 623 Sears model designation was shared with an earlier era Harmony-made archtop. 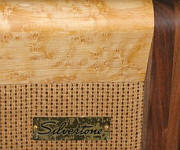 600 series from Harmony, but mahogany topped, and natural finished. Interesting figuring to the top on this one: Relisted from last month. When my little girl is watching "Wheel of Fortune," just before they take the spin, she says "Big Money! Big Money!" Well, we're startin' today's auctions off with some Big Money thrown down for this very nice 1457 setup. 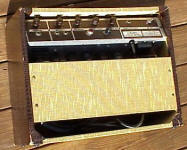 1457 Dano SSEG with tube amp in case VG $800 Clean guitar, minimal wear to amp and guitar, footswitch incl. 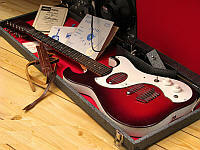 1487 Teisco MIJ SBEG w/ Solid State Amp $450 BO One of the nicest ones of these I've seen. 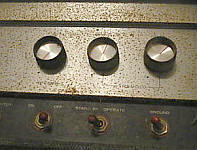 The amp works (! 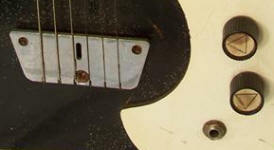 ), the body and headstock show minimal wear, whammy arm missing, knobs are stock (one has a chip to the skirt), the only thing missing is the "SILVER TONE" medallion. 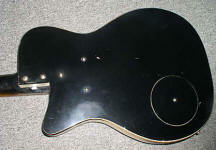 1304 Dano SSEG G $700 BIN Both knobs missing, playing wear at bass bout, plenty of surface dings and finish flakes, bottom strap button missing, all hardware shows rust, back panel missing, logo nearly worn away , plenty of fingerboard wear , this baby's been played! 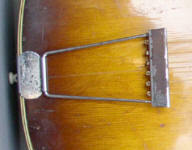 Pot codes indicate a late '59 build, and the square neck/body joint and round access panel opening support that. 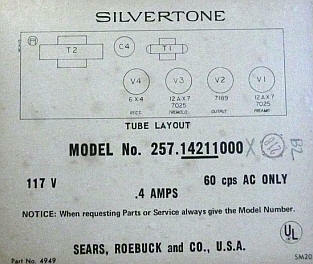 Even though it's not on the amp panel, the schematic and inside label still claim "Silvertone." 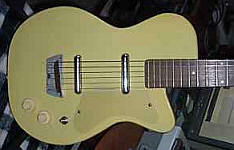 Well, here's a first: I've never seen a 615 (and we've seen a BUNCH the past year) modded to be an electric. 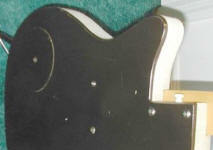 But, here you go, simple single coil up near the neck, and a jack on the treble lower bout. 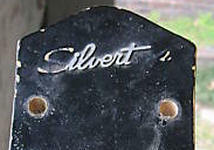 "Not even on Silvertone World!" Well, there ya go! Both a compliment and a rebuke. 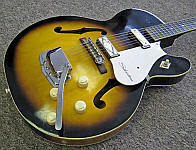 I'm happy that the seller thought that since it wasn't on Silvertone World that the guitar they had up for sale was pretty rare. 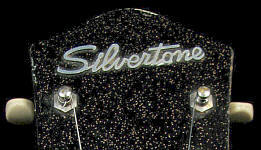 Right after the 'compliment' wore off, I realized there are a BUNCH of electric and acoustic guitars that I need to post here at Silvertone World. So, I'm gonna get to work. 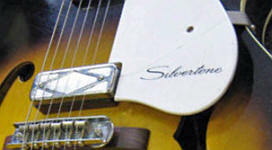 If it ain't here, I'm aimin' to get a page up for it here at Silvertone World. If you haven't visited all of February 2009, check out all the great stuff that sold last month! Alright, March.... here we go!